ab31901 is a recombinant protein produced in E. coli. ab31901 is >98% pure, as determined by RP-HPLC analysis. Our Abpromise guarantee covers the use of ab31901 in the following tested applications. AP Use at an assay dependent dilution. THIS AFFIBODY® MOLECULE REQUIRES CONJUGATION TO A SUITABLE LABEL BEFORE USE. PLEASE REFER TO THE "PROTOCOLS" SECTION. Overlay chromatograms of repeated affinity removal of IgG from serum are shown. 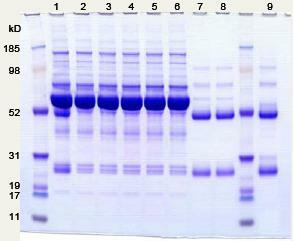 The chromatograms represent run number 1, 50 and 300 after consecutive injections of 700 ul of five times diluted human serum on 0.37 ml SulfoLink® Coupling Gel with immobilized Anti-IgG Affibody® molecule. The peak area of eluted fraction after each run is plotted in the image below. The identical chromatograms and consistent peak areas of eluted fractions prove that the depletion procedure can be reproducibly repeated at least 300 times without loss of binding capacity. 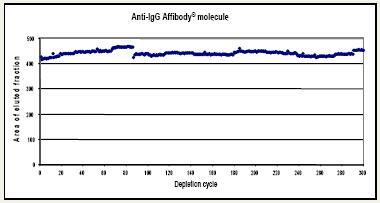 SDS-PAGE analysis of flow-through fractions and eluted fractions shown in the third image demonstrate that the high specificity of the Anti-IgG Affibody® molecule is maintained through all the 300 consecutive injections. The capacity of this coupling gel allows for depletion of IgG from 1900 ul of five times diluted human serum per ml gel, corresponding to 380 ul of undiluted human serum per ml gel. Peak area of the eluted fraction after each run of affinity removal. The consistent peak area prove that the depletion procedure can be reproducibly repeated at least 300 times without loss of binding capacity. SDS-PAGE analysis of flow-through fractions (FT) and eluted fractions after repeated affinity removal of IgG from human serum. ab31901 has not yet been referenced specifically in any publications. Publishing research using ab31901? Please let us know so that we can cite the reference in this datasheet. Can you tell me if I can denature the affibody to use as a specificity test in a validation protocol? Thank you for your enquiry. Your question is an interesting one. The alpha helix structure of the affibody molecules can be "destroyed" to a random coil by heating to above 90 degrees C and adding denaturing agent (guanidinium hydrochlorid or urea) > 4-5 molar; or alternatively use high concentration of SDS. Extreme pH is not recommended. This process is however reversible. Affibody molecules are very hardy. The alpha helix structure will come back together again when the temperature is lowered and the denaturing agent is removed. To irreversible denature an Affibody(r) molecule (precipitating), we would suggest using acetone (to 75-80%). This should work for all proteins. I hope this information helps, please do not hesitate to contact us if you need any more advice or information. I noticed that you are carrying this molecule. I am interested in obtaining biotin-labeled Anti-IgG Affibody. Would you be able to obtain it for me? It is very difficult for us to obtain products from overseas without a lot of paperwork. I would really appreciate your quick response. Thank you. Thank you for your enquiry. Yes, this product is available as catalog # ab31901. I have included a link to this datasheet below. I hope this information helps, please do not hesitate to contact us if you need any more advice or information.